While these pictures seem to show the women in leggings rather than knickers, the outfit is pretty much as Annie described it. The imaginary women in the prints are also shown as if they were wearing corsets. What did Annie have to say about that? 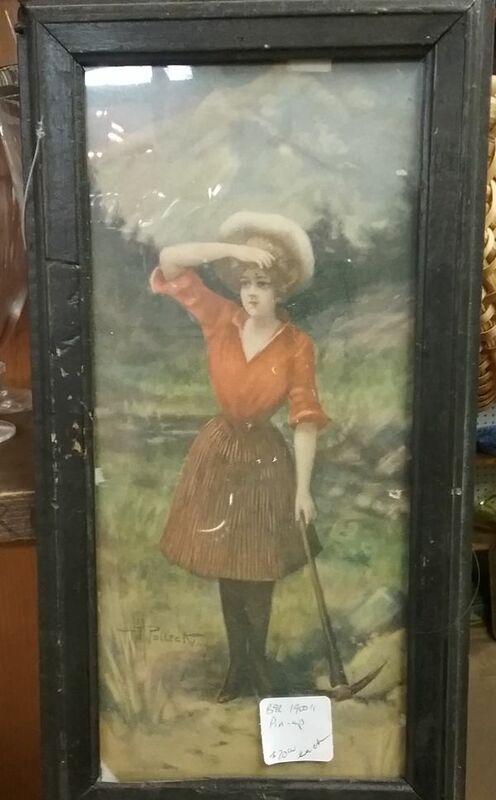 Images of women participating in sports were popular in the early 1900s. Artists like Coles Phillips and Howard Chandler Christy were known for their sporty, but still very feminine, women. This artist seems to be sexualizing the women somewhat, with the posing and the slender legs. I think the signature is T T Pollock, but I could not find a reference to that name, nor to Polleck. Maybe someone will recognize it for me. Update: Researcher extraordinaire Lynne has discovered that the artist was Homer Polleck, though some references have his name as Pollock. He lived and worked in Kansas City, Missouri, and died in 1917. My Goodwill Outlet Center is a place of wonderment. Walking through the door one gets a feeling of infinite possibilities. What will I find in the over-stuffed bins? Will they be full of seldom worn but already looking tired fast fashion, or will there be pristine vintage galore? 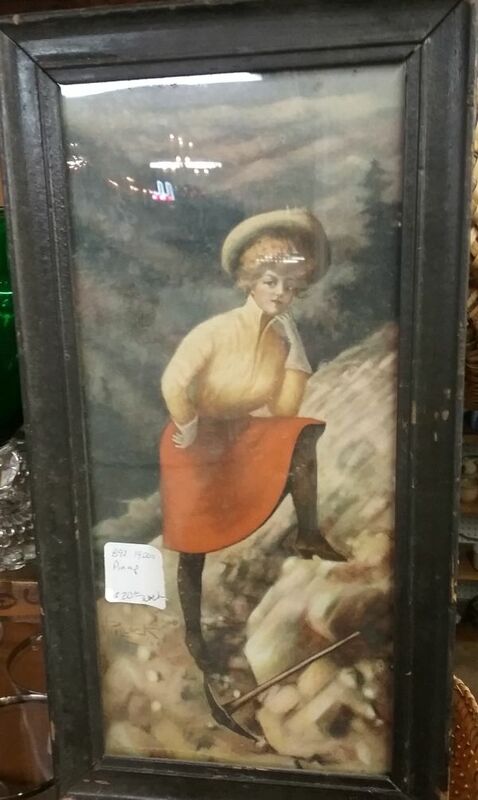 Vintage and antique people seem to me to be the world’s worst lamenters over “the good old days.” I’ve done my share of it, whining over a closed flea market or an antique mall turned into a decorator marketplace. 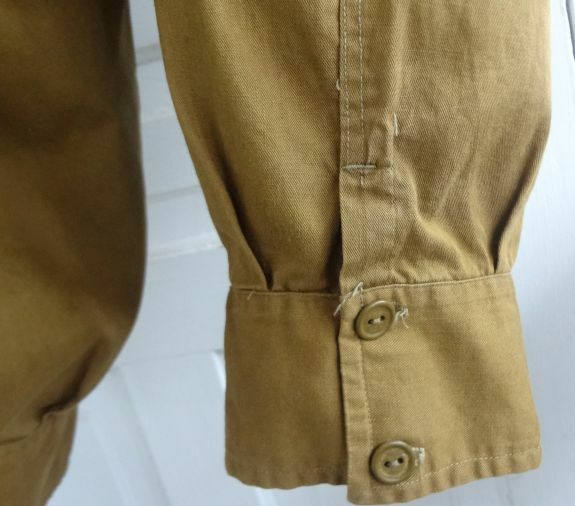 People even lament that the Goodwill is not as great as it once was, and the truth is, I haven’t found any early clothing there in a long time. But I always say that treasure is where you find it, and if you don’t look, it is not going to be found. I can’t help thinking about what happens to all the unfound treasure at the Goodwill Outlet. It is bundled to go to a rag house where the stuff is picked through again, and hopefully anything of value is plucked from the piles before they are rebundled for transport to Africa, or even worse, to a textile recycling facility where the clothes are shredded for reprocessing. On my latest trip to the land of vintage possibilities, I was going through a bin of used handbags and nylon backpacks. At the bottom of the bin I spotted a scrap of old fabric, and quickly uncovered what you see above. 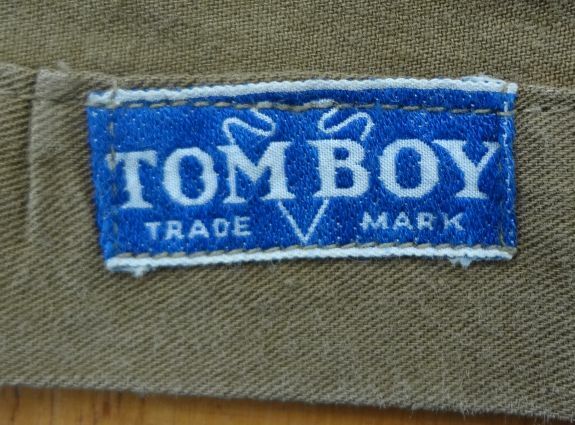 At first I thought it might be an old military bag, but the interior of the bag had a promising label. That’s when I knew I had a treasure. The Abercrombie on the label was David Abercrombie of Abercrombie & Fitch, outdoor outfitters to the early twentieth century adventurers. The business was started in 1892 by Abercrombie,who was joined in the business in 1900 by Ezra Fitch. 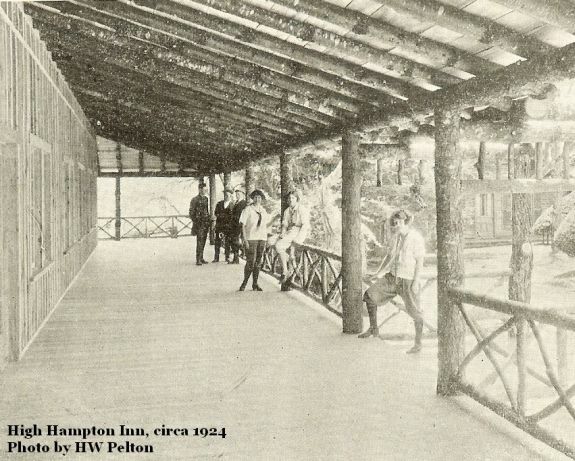 In 1907 the two parted ways, with Abercrombie leaving the business he had started. The following year he went on to manufacturer and sell camping supplies, and even made items that were sold in the Abercrombie and Fitch store and catalog. 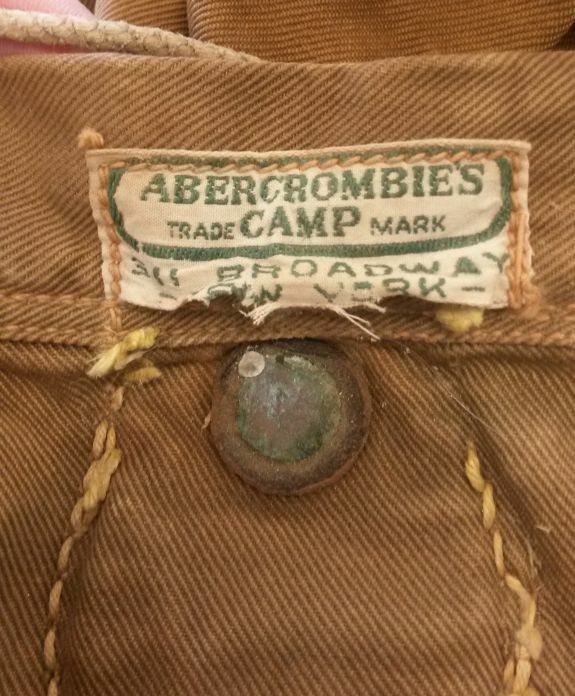 Abercrombie set up his new business, Abercrombie’s Camp, at 311 Broadway. The company also sold through a catalog. The earliest I could online find was dated 1912. It seems a bit odd that Abercrombie’s name was continued to be used by Fitch, as the two were competitors for the same market. I imagine they were often confused for each other, as I was when I first saw the label. I thought it was an odd A&F label, but instead, was an entirely separate company. 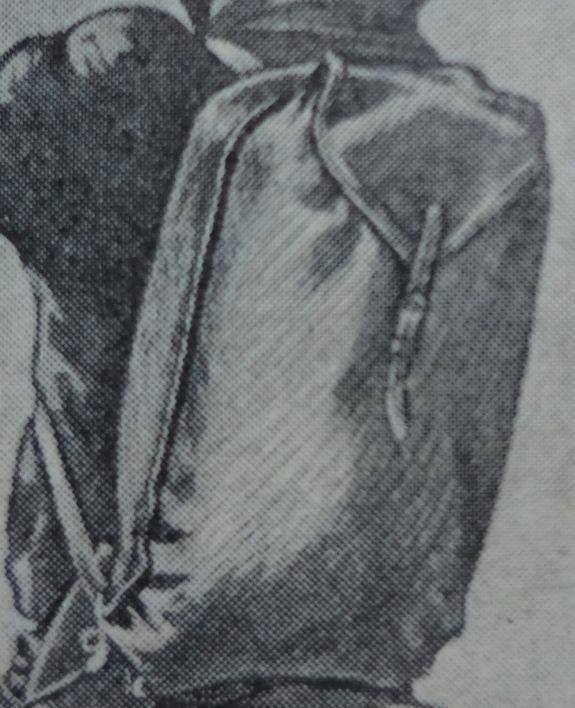 Lucky for me, I do have that 1910 A&F catalog, and it does have my bag, or a very similar one, pictured. 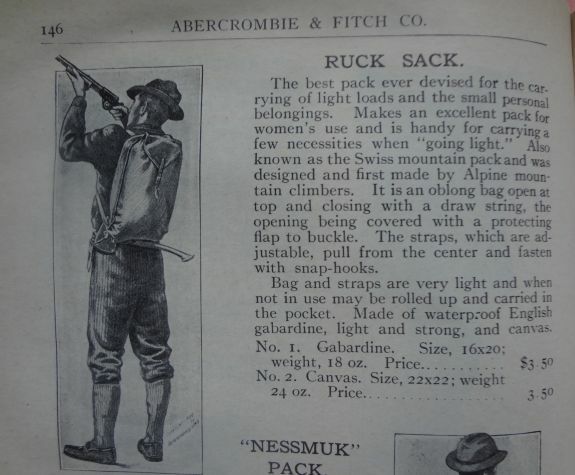 They called it a ruck sack, also known as a Swiss mountain pack. Mine is the gabardine version. One big problem that collectors face in an object like this one is how to best preserve it. Does one wash it? Should it be returned to a “better” condition? To me, one of the charms of a piece like this one is that it shows that it was used. I’d much rather have it than a pristine example that did not go on numerous hikes across the Southern Appalachians. And it was obviously used a lot. 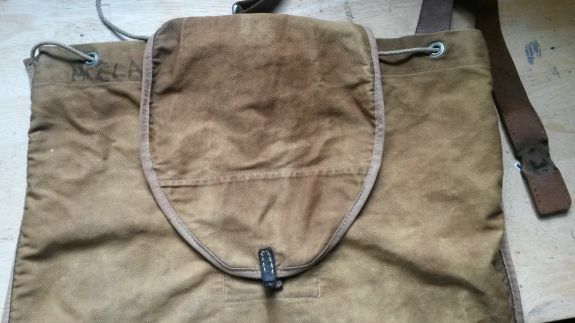 One of the leather straps has about seven inches missing off one end, and the little leather piece that fastens the top flap is partially missing. I thought about either replacing the straps, or having a leather crafter replace the missing bits, but ultimately I’ve decided to leave them as is. 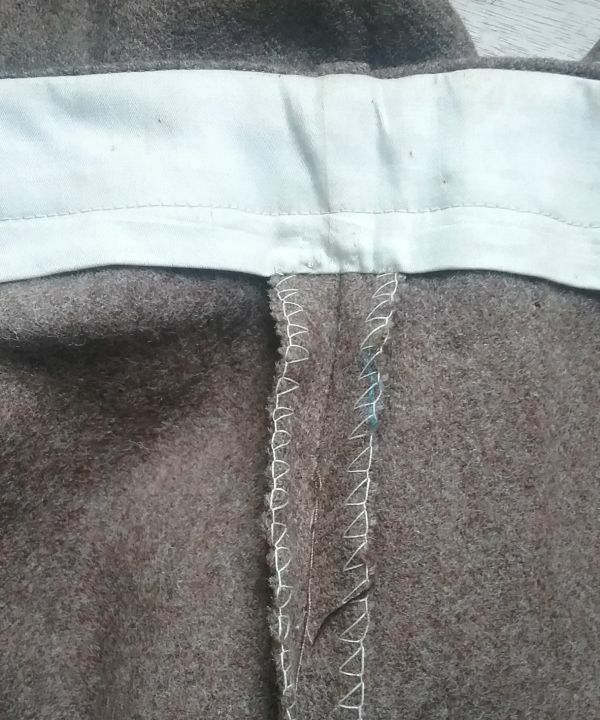 If I ever display it I may make temporary repairs with brown fabric to show how it would have been used. I did decide to use a bit of leather cleaner and conditioner on the leather pieces. I also gave the bag a quick mild detergent bath to loosen any dirt or oil that was not set in the fibers. I can’t tell that it improved the appearance, though it did produce a very dirty tub of water. A bonus with this bag is that there is a name. I can’t decide if it is M. Clark II, or McClark II, but I’ll be searching the records of the local hiking clubs (which go back to the late 1920s) to see if there is a match. 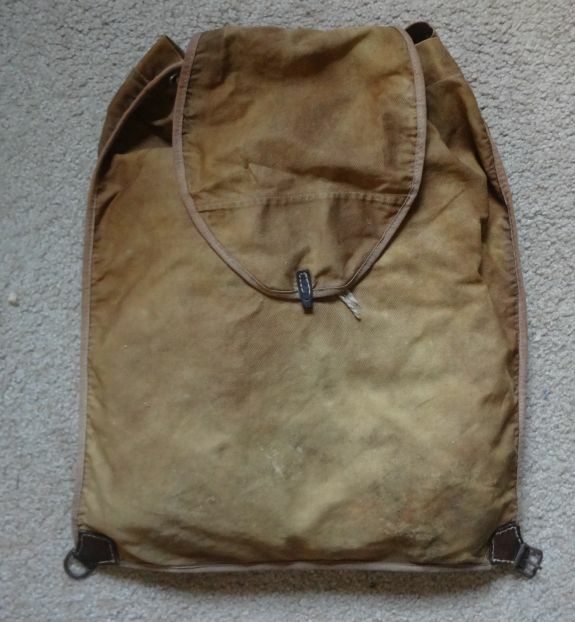 And here is the bag after the little bit of cleaning. 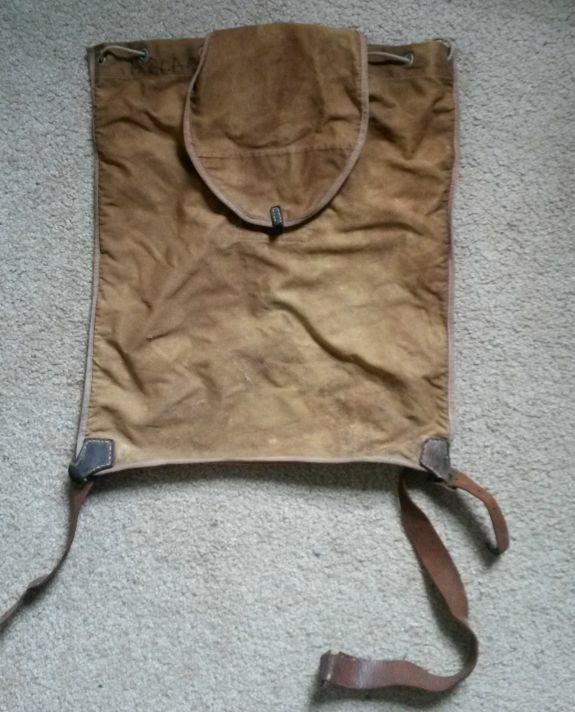 You can still see all the years of hard use this bag was subject to. 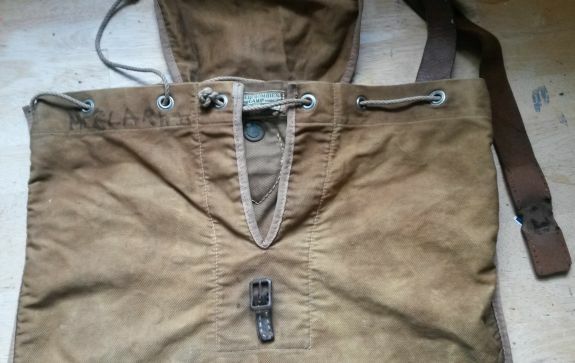 I really can’t narrow down the date of the ruck sack very much. 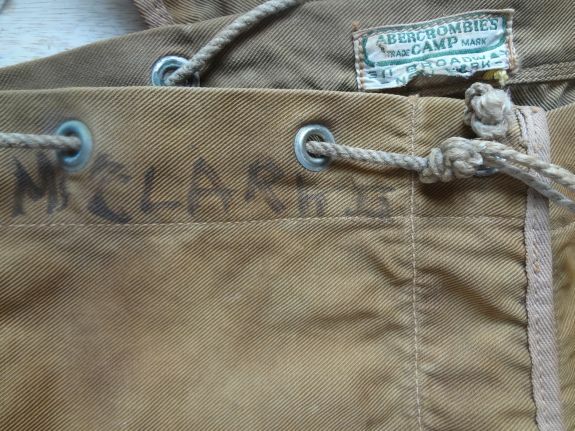 I know the earliest possible date would be the year Abercrombie’s Camp was established, 1908. The missing information is how long was this bag in production. The next A&F catalog that I have is 1939, and the style is not in that book. Still that is a range of thirty-one years, and I’d really like to do better than that. 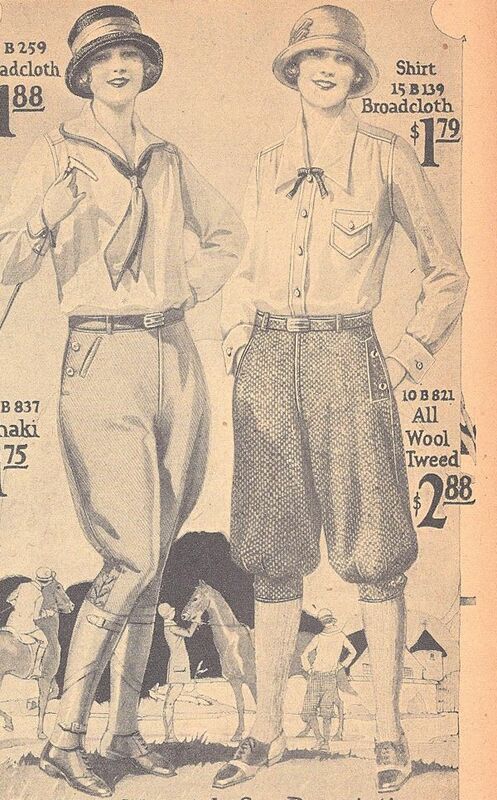 If you have an Abercrombie’s Camp or an Abercrombie and Fitch Catalog dated before 1939, I’d sure appreciate hearing from you. 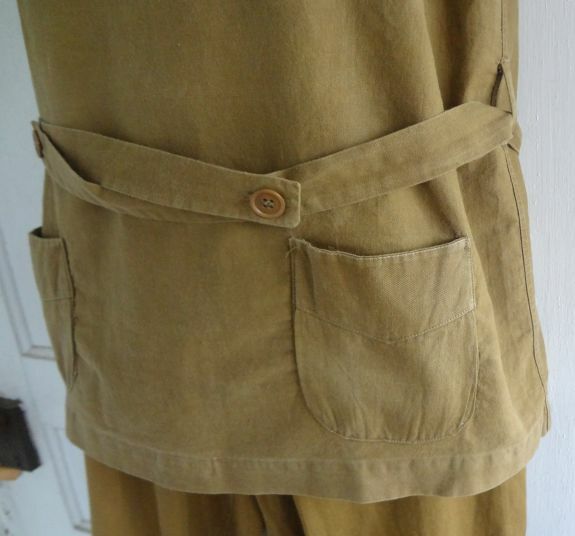 By 1917 many women were also wearing some form of pants as needed for their work during World War One. 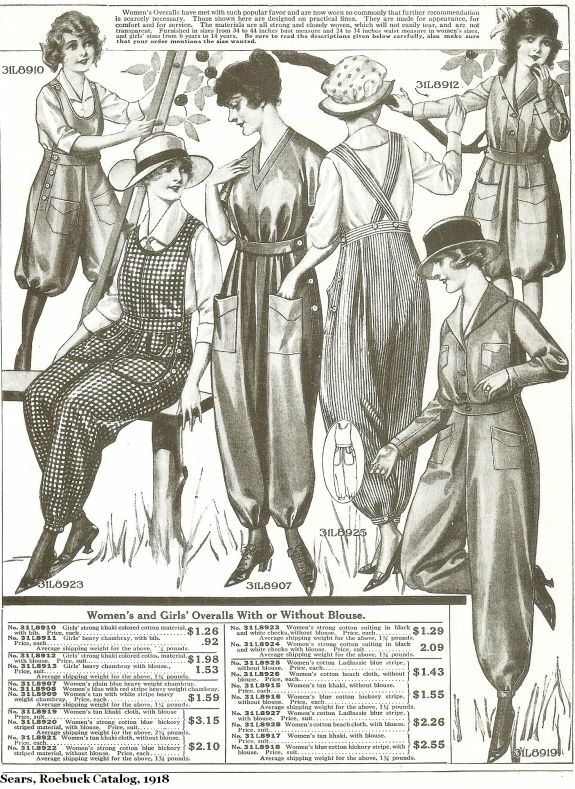 Mass market retail and sewing pattern catalogs offered a variety of overall and work pants for women. But after the war ended, these patterns and garments quietly disappeared from catalogs. The skirt convention seemed to have overruled practically in women’s work dress. 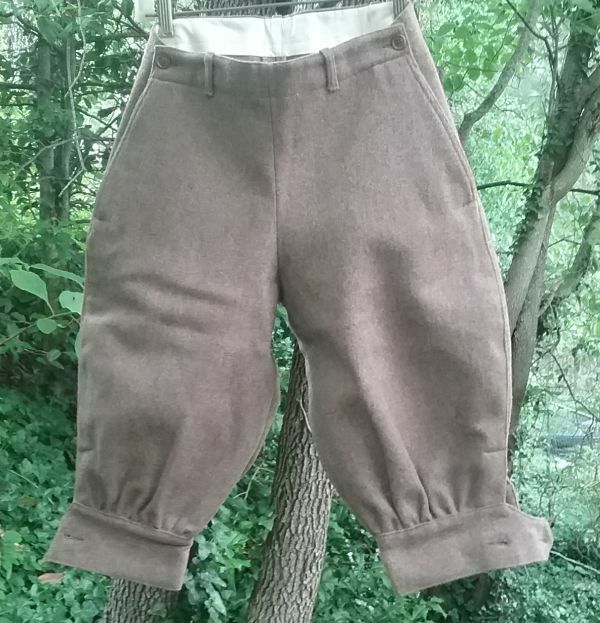 But in the woods, knickers and breeches had pretty much put the skirt issue to rest. 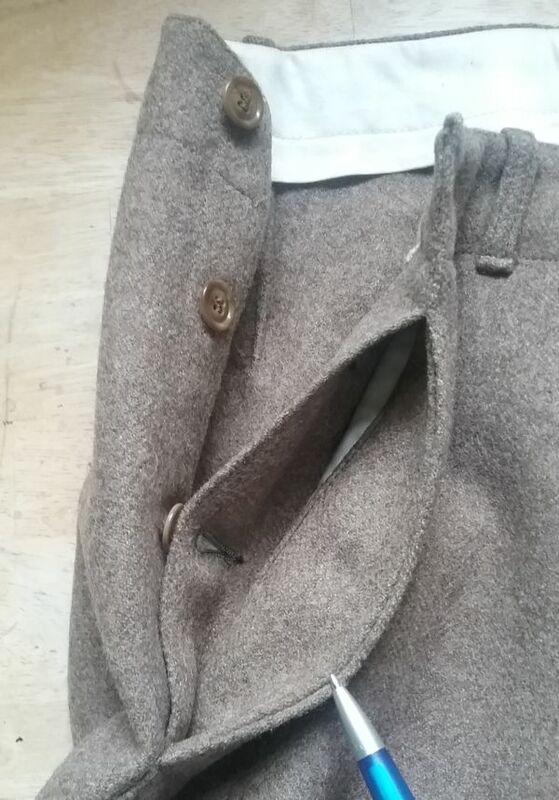 Most articles that I found on the subject between 1918 and 1930 mentioned an overskirt only as an afterthought, if it was mentioned at all. 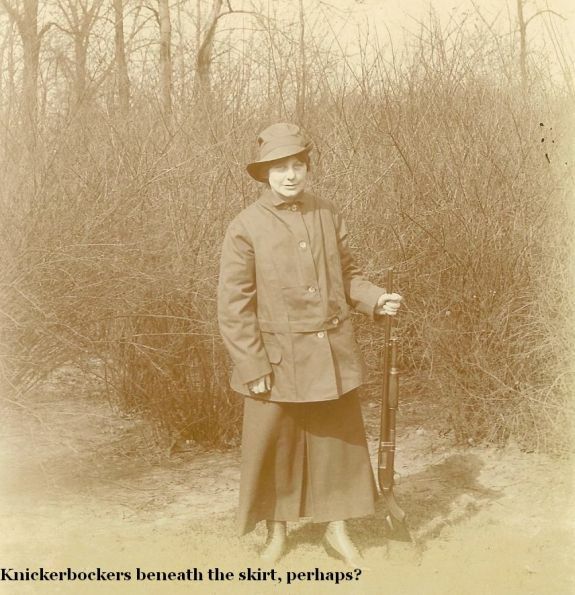 In 1920 writer and outdoorswoman Nancy B. Katz wrote in Outers-Recreation magazine that the skirted woman in the woods was obsolete. So how did knickers for women leave the hiking trails to become a fad? 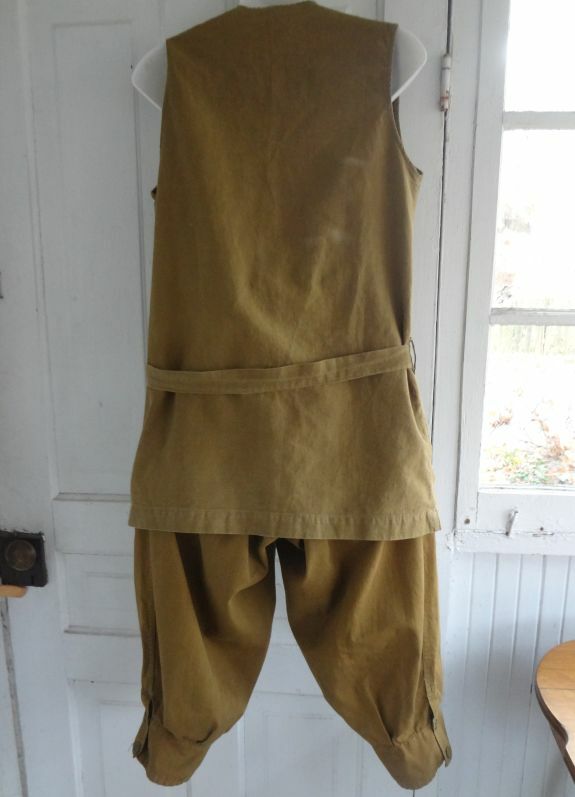 Many women had become somewhat accustomed to wearing some form of pants, whether in the woods, in the school gymnasium, on the job during the war, or even in the form of a bathing suit. It may also have something to do with the 1920s idea of woman as garçonne, as dressing for women took on touches of the masculine. His complaint was too little, too late. 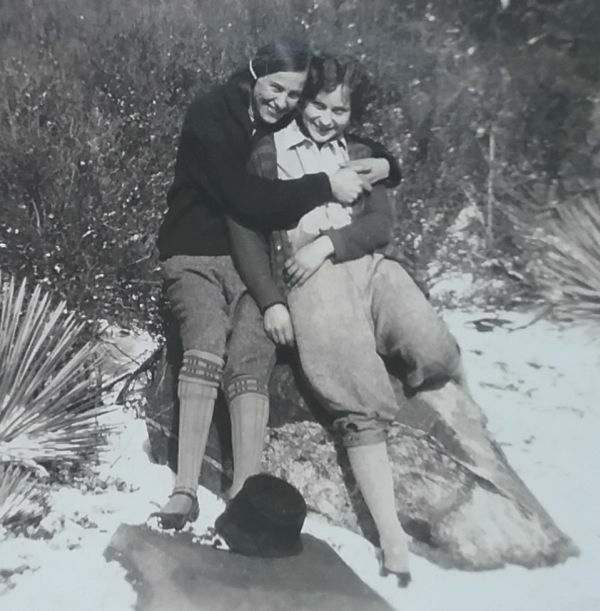 Women were wearing knickers, not only for hiking, but for other casual occasions and for motor-car travel. 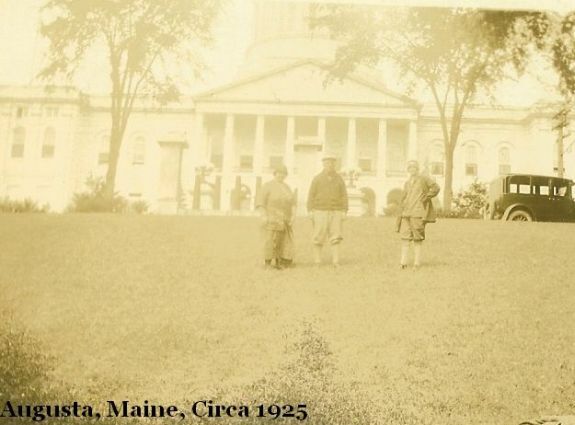 Here is a family group in front of the State Capitol in Augusta, Maine, circa 1925. 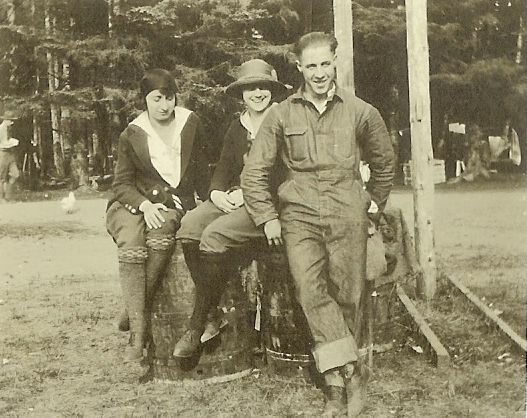 The young woman on the right is dressed more like her father than her mother. If not for the cloche hat we might have mistaken her for a boy. 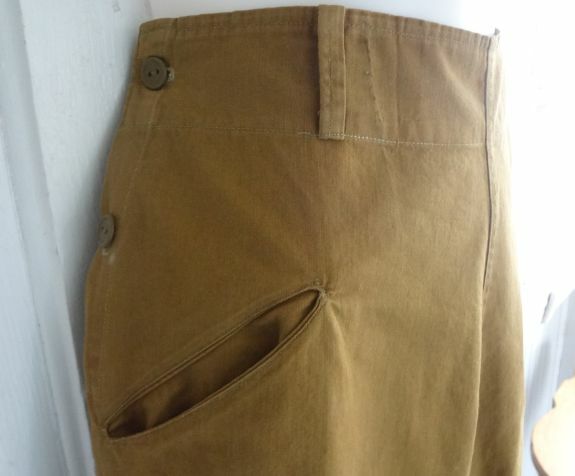 By the mid 1920s pants for women were here to stay, though it would be several more decades before women could freely wear pants on any occasion. 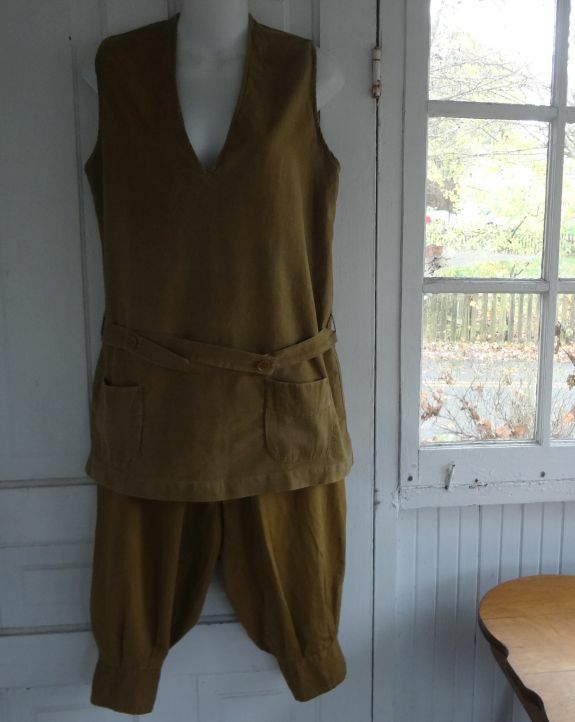 The knickers-wearing girls of the 1920s became the pantsuit–wearing grandmothers of the 1970s, who had learned years earlier the comfort and practicality of pants. I hope that everyone enjoyed my presentation. I appreciate all your comments, and especially ant additional information that may add to this story. 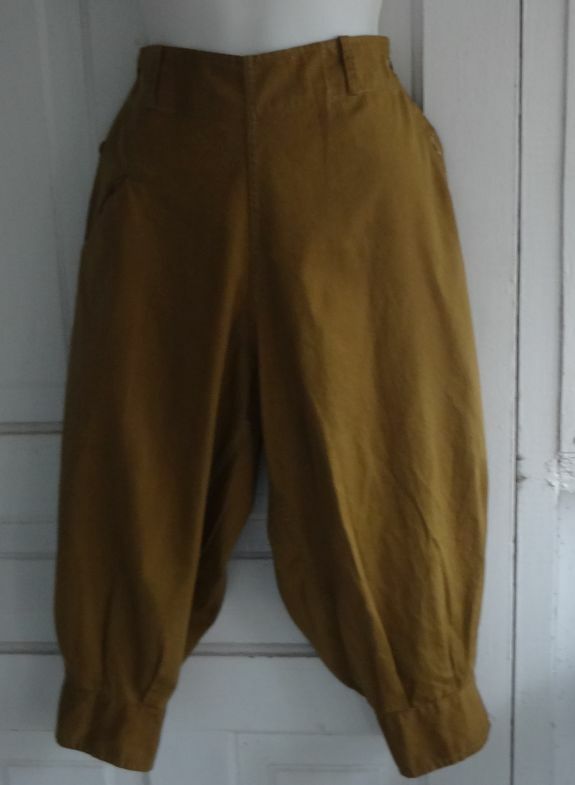 The history of women wearing pants is a complicated one with many contributing factors to the end result. I’ll be continuing to investigate this fascinating story. By the turn of the 20th century, knickers or breeches under a short, wide skirt became the hiking outfit most mentioned in magazine articles. There were some exceptions, most notably an article written by outdoorswoman Annie Peck. 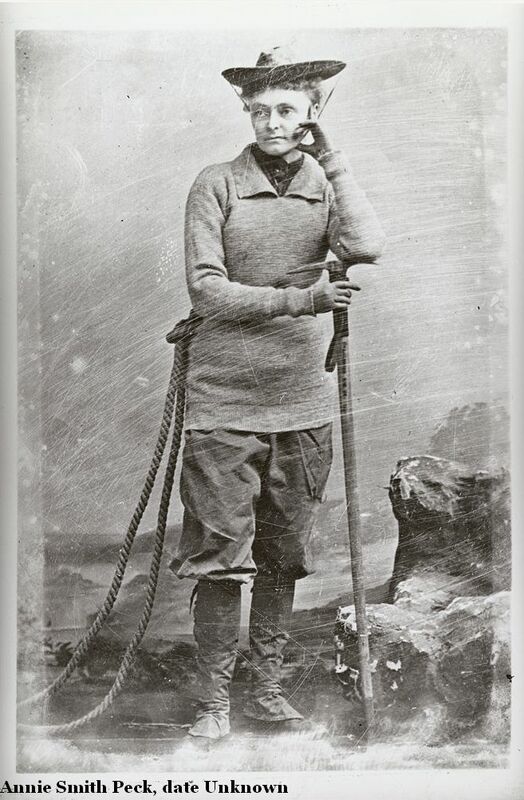 In 1895 Peck became the third woman to climb the Matterhorn, but she was the first to do so without wearing a skirt. In her day Annie Peck was well-known, her adventures being widely reported. 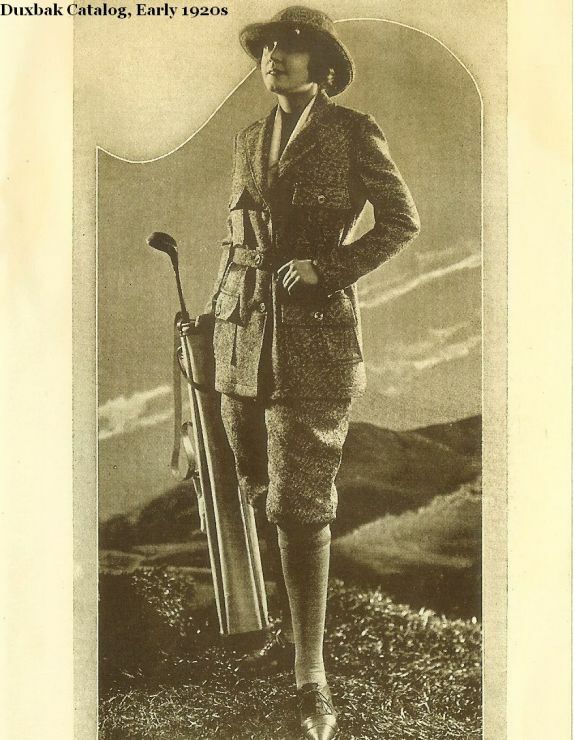 In 1901 she wrote an article for Outing magazine detailing her climbing and hiking outfit and expressing strong views about the inappropriateness of skirts on mountains. But even the independent Ms. Peck had to concede to the skirt convention when on easier hikes. It seems as if women took Peck’s advice. 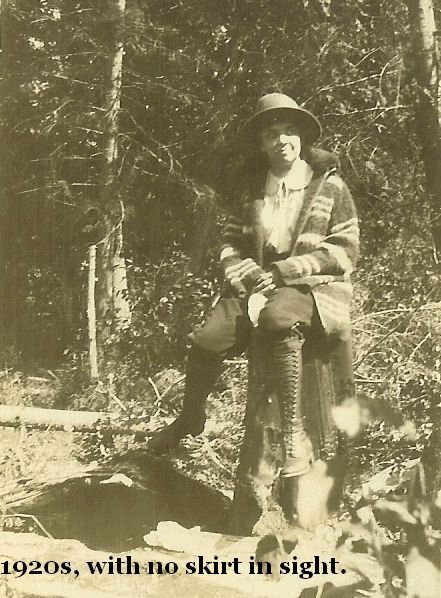 In a 1904 article in Outing, hiker Rena Phillips described how she had a big pocket put on the back of her jacket so when out of sight of civilization she could remove the skirt and place it in the pocket. For the next ten years or so, the knickers and removable skirt seemed to be the most popular option, being mentioned in numerous articles and accounts. 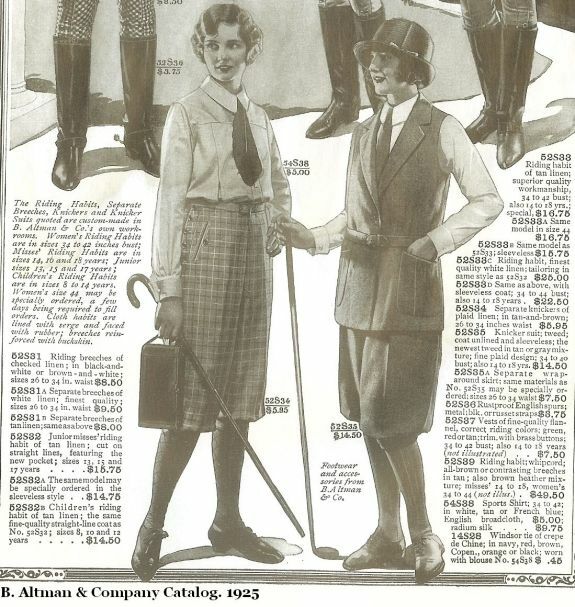 One writer in 1913 claimed she rarely wore her hiking skirt but always carried it with her as it was useful as a rain cape. As strong as the skirt convention was, it was being challenged by 1916. 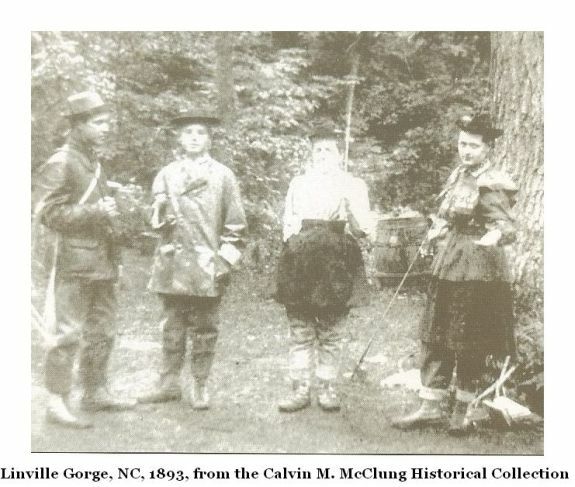 In that year William J. Whiting wrote an article for Outing titled “Should the Woman in the Woods Wear Skirts, Bloomers, Riding Breeches, or Knickerbockers?” He argued that the wearing of skirts in the woods was a form of false modesty. Whiting went on to declare that only knickers were suitable for hiking.